Sixteen-year-old Cara Lange has been a loner ever since she moved away from her best and only friend, Zoe, years ago. She eats lunch with the other girls from the track team, but they're not really her friends. Mostly she spends her time watching Ethan Gray from a distance, wishing he would finally notice her, and avoiding the popular girls who call her "Choker" after a humiliating incident in the cafeteria. Then one day Cara comes home to find Zoe waiting for her. Zoe's on the run from problems at home, and Cara agrees to help her hide. With her best friend back, Cara's life changes overnight. Zoe gives her a new look and new confidence, and next thing she knows, she's getting invited to parties and flirting with Ethan. Best of all, she has her BFF there to confide in. But just as quickly as Cara's life came together, it starts to unravel. A girl goes missing in her town, and everyone is a suspect—including Ethan. Worse still, Zoe starts behaving strangely, and Cara begins to wonder what exactly her friend does all day when she's at school. You're supposed to trust your best friend no matter what, but what if she turns into a total stranger? 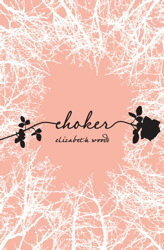 I admit to knowing very little about Choker by by Elizabeth Woods before I recieved it, having ignored most of the reviews that have popped up so far. Mostly I liked the pretty pale pink cover and I felt like reading a YA psychological thriller might be fun for a change! It was definitely different to my usual fare and provided a bit of variety, but I was also a little disappointed to have guessed the big twist fairly early on. Even so, I did for the most part enjoy Choker. It's main character, Cara, is a kind of a loner. She doesn't really fit in very well and doesn't have many actual friends since she moved away from her one true friend Zoe several years ago. After a really humiliating experience at school in which Cara has gained the unfortunate nickname 'Choker' she returns home to find Zoe there for a visit. She's run away from would like to hide out in Cara's room. Cara is of course overjoyed at first! Having her best friend around for support whilst the 'Choker!' taunts die down is a wonderful thing. It's nice to be able to talk to somebody and have someone understand how lonely Cara is and how much she wants what the popular girls have. In particular, the attention of Ethan Gray. This book isn't particularly long, so it isn't long before things in Cara's life begin to unravel. Zoe begins acting strangely and more demanding, girls from Cara's school start going missing. And Cara would like to ignore it all for the most part and pretend that things are OK, because some parts of her life are OK - Ethan has finally taken notice of Cara, flirts with her even. But what's really going on with Zoe? What is she doing on her own all day? And can Cara really trust her? The build-up towards the end really made the hairs on the back of my neck stand up! Don't you just hate in when you work out how a book's going to end? This definitely sounds like a tense read, I'm not sure whether it'd be for me or not. Jenni - You know, it doesn't happen very often for me actually which is why it was even more disappointing that it happened this time. Usually I don't even try to guess because I'm pretty bad at guessing. Still, it was a pretty good read. OMG - I must be so slow, because I really didn't guess at all. I didn't see it coming. I thought Choker was great fun, and pretty dark for a YA. I figured out what was going on pretty early on, but I still really enjoyed this one! Leanna - It WAS pretty dark, that's for sure. And I love that it was, I think the boundaries for YA need to be stretched a bit..